As a pre-quel to my BLOGGING FOR BEGINNERS class to be held at the Mesa Family History Expo later this month, Ol' Myrt would like to spotlight the following genealogy blogs as examples of what you can do with your genealogy blog. Admittedly these geneabloggers are experienced, but it is from folks like these that we learn more about this newer method for "getting the word out". 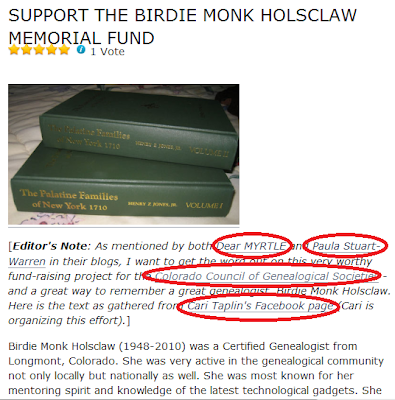 Support the Birdie Monk Holsclaw Memorial Fund posted 3 January 2011 by Thomas MacEntee. In this posting, Thomas spotlights the work of four others who influenced his writing; demonstrating his respect for peers, and contributing to a positive sense of community among geneabloggers. When was the IGI? 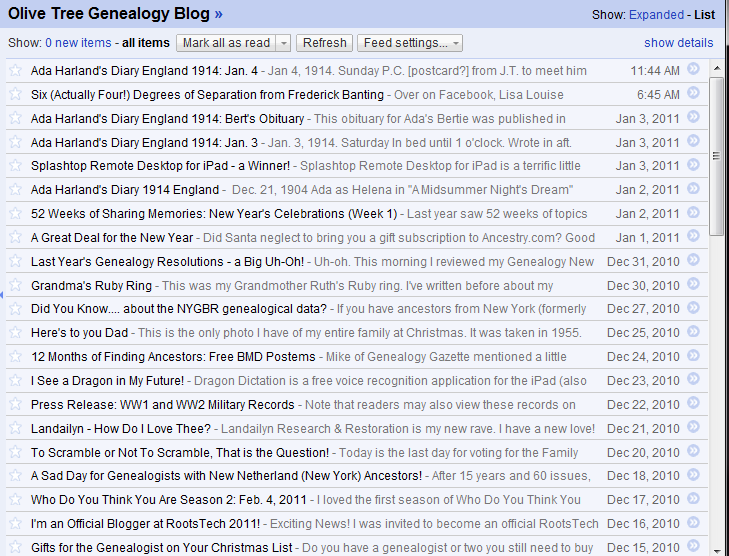 posted 4 January 2011 by the Ancestry Insider, part of an IGI series. AI writes: "The IGI was originally known as the Computer File Index, according to the book Hearts Turned to the Fathers.1 According to Elizabeth Nichols, retired FamilySearch employee, it was first published on microfiche in 1973. It contained 20 million entries, consisting of all names gathered since October 1969, and six million of the names gathered before then. About 80% were extracted.2, 3"
Note AI's use of footnotes for source citations, common in scholarly genealogy publications yet seldom seen in geneablogs. I prefer to cite my source within the text and by providing hyperlinks wherever possible. Either way, it is important to give credit where credit is due. Below please find a screen shot of the footnotes that apply to the Ancestry Insider's quote. 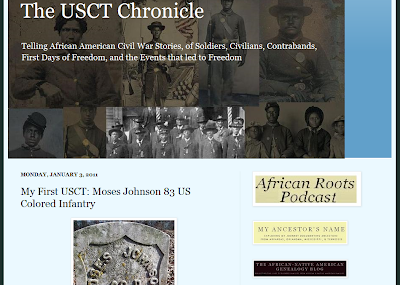 My First USCT: Moses Johnson 83 US Colored Infantry posted 3 January 2011 by Angela Y. Walton-Raji. 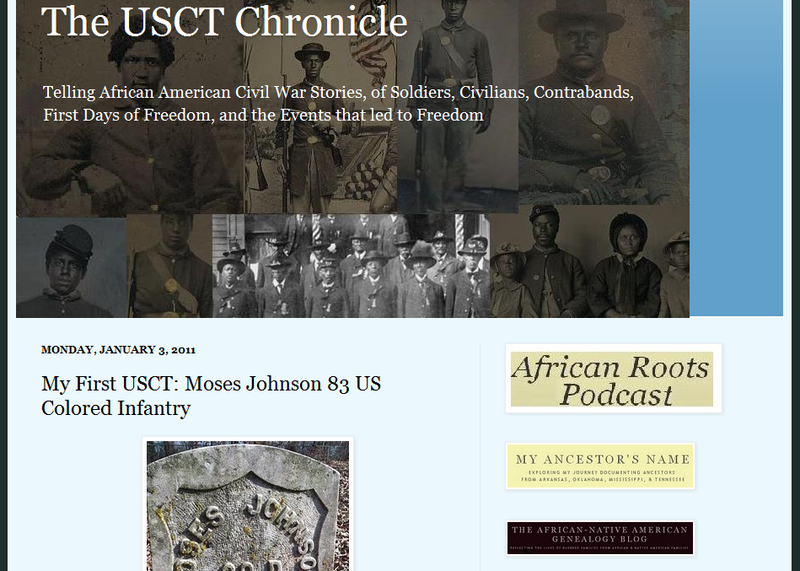 "It turned out that Moses Johnson was also a Cherokee Freedman, and I found his Dawes Enrollment card, as well as that of his son, Lewis Johnson, so even more data came from researching this man's life and learning about a man who was an active participant in several major military campaigns in the Arkansas/Oklahoma communities." Angela's blog pot includes photos and scans of source documents she discovered during her research on Moses beginning in 1991. The reader follows Angela's discovery process, and gains an appreciation that genealogy isn't a quick-study. A closer look at FamilySearch "Historical Records Collections" searches posted 29 Dec 2011 by GeneJ Composer on the They Came Before blog. This geneablogger encountered problems when using FamilySearch.org's online scanned images and attempting to cite the source of those images. This blog entry gives other researchers the benefit of GeneJ's experience, and hopefully will cause FamilySearch to modify how source citations are composed. 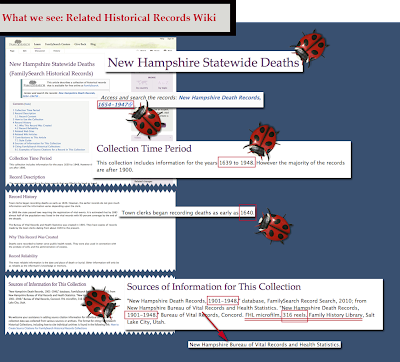 GeneJ wrote: "I don't know why someone chose to give the wiki a different name ("New Hampshire Statewide Deaths") than the database (New Hampshire Death Records, 1654-1947"). Personally, I found that a little confusing. I discovered other inconsistencies on the wiki page, especially about the record dates. We know the database title carries the dates "1654-1947"; however, in one section, "Collection Time Period," someone entered, "This collection includes information for the years 1639-1948"--so, beginning 15 years earlier than the database title suggests and ending one year later. Another section, "Record History," opens with, "Town Clerks began recording deaths as early as 1640." (Okay, so where do those 1639 records come from? Are they in the otherwise 1654-1947-dated database?)" Long Island Chowder by Biz Chase posted 3 January 2011 on the ProGenealogist Blog channels his nostalgic feelings during the holidays. "My great-grandmother made the chowder every year when I was young. Looking back, that is the only time I recall seeing her ever touch a stove… She wasn’t your average plump, always pulling cookies out of the oven grandma type, Bram had that extremely fashionable, elegant, on the cover of a magazine type aura about her". Though the ProGenealogists Blog tends to focus on educating readers about how to do research, it is nice to see Biz appreciates the importance of sharing our impressions about family traditions. Feb 1733 Philadelphia posted 4 January 2011by Deci at the Wild Rhododendrons Blog with information about her sixth great grandparents, Anthony Conard and Sarah Hatfield, who were married at Gwynedd Meeting, in Montgomery County, Pennsylvania, as recorded in the minutes of Monthly Meeting held the 26 day of the 2nd month 1733. While transcribing, Deci is careful to distinguish her editorial comments using parenthesis. The only thing Ol' Myrt would suggest is to include the scanned image of the original page being transcribing. 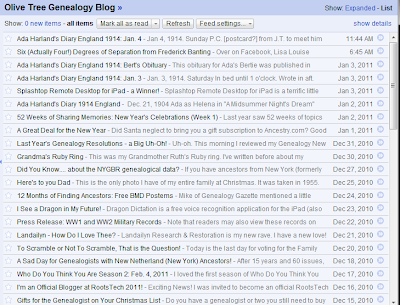 This is a screen shot from Ol' Myrt's Google Reader featuring the last bunch of Olive Tree Genealogy Blog posts. It is much easier to let Google search for new blog postings. I reserve actually going out to visit a specific blog site when I want to post a comments in response to blog posting. A GREAT BIG THANK-YOU to these seven genealogy bloggers for their fine work. Thanks for the shout out at GeneaBloggers - and I hope more genealogy bloggers will take the time to link to other colleagues. Remember, we're all in this together! This post made my day. Thank you. You may never know the help you have been. You are such a classy lady. You could have illustrated each of these points with exemplary examples from your own work. I would have, clueless that there was a better way. When I grow up I want to be as magnanimous and thoughtful as you.